6 The College of New Jersey Magazine Try this open-book quiz — all the answers are in this issue. Though that doesn't mean we won't work you a bit. 1. Philosophers known as utilitarians believe that our primary purpose is to serve societal needs. ❏ T or ❏ F 2. The rare Bible that history department chair Celia Chazelle studies was destined to be given to Pope Gregory III, of Syria. ❏ T or ❏ F 3. A single baked good won an alumna a cash prize from the Food Network equal to two semi-decent Super Bowl 2019 tix. ❏ T or ❏ F Send your answers to magazine@tcnj.edu by February 28, 2019. 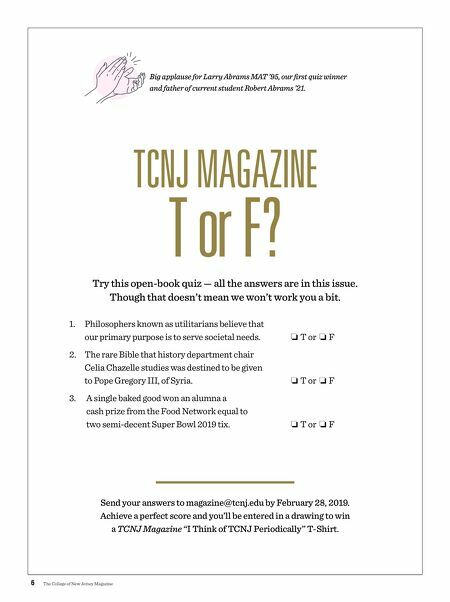 Achieve a perfect score and you'll be entered in a drawing to win a TCNJ Magazine "I Think of TCNJ Periodically" T-Shirt. 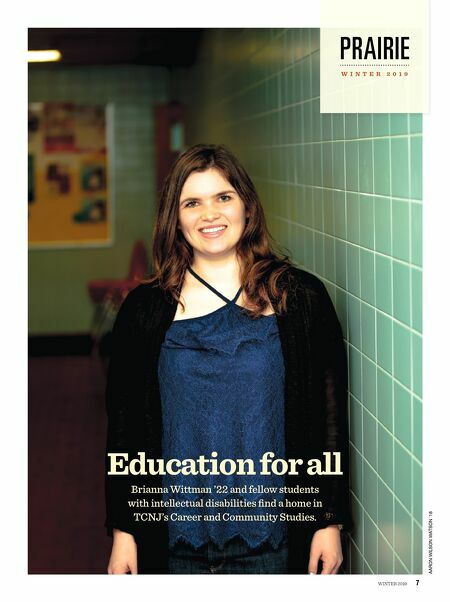 TCNJ MAGAZINE T or F? Big applause for Larry Abrams MAT '95, our first quiz winner and father of current student Robert Abrams '21.